It is the mission of Rockwall Indoor Sports Expo and RISE Total Fitness is to encourage parents, athletes, and the community to strive for excellence. Our goal is to promote and foster an atmosphere that is conducive to the intellectual, personal and physical development of each individual. Developing a strong relationship with the community and its athletes is critical in motivating him/her to realize his/her potential. We are dedicated to providing equal opportunities to all athletes and contributing to the total sports experience. Our primary objectives are to teach the Science based core principals of nutrition, strength and conditioning in order to improve athletic performance, and reduce the risk of injury. We welcome Dan Senak, Dallas Fireman and Paramedic of 11 years. Sports and exercise has been his lifelong passion. After playing football and lacrosse in high school, he decided on the trades for a career. He continued his athleticism by involving himself in karate, snowboarding, snow skiing, roller blading, roller hockey, and mountain biking. In his late twenties he wanted more fulfilling work and trained to become a paramedic and firefighter, working in the Medical City Dallas ER while testing for fire departments. Fireman are encouraged to stay fit and Dan certainly has done that. He is currently working to obtain his personal trainer certification from NASM (National Academy of Sports Medicine). He is looking forward to helping his fellow brethren as a personal trainer and fitness coordinator. He believes that through exercise a person can live a full productive life into their senior years by staying active and healthy. Dan will be offering numerous classes and personal training sessions at the RISE. Please stop by and visit with him. 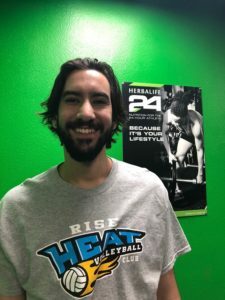 He is a very energetic, knowledgeable, positive individual wanting to help you obtain your fitness goals. My name is Vito Peralta, recently transplanted from Southern California. I grew up playing a variety of sports, finally concentrating on volleyball. I sought out to find as much coaching and experiences as I could; I worked as a coach’s assistant for a nationally ranked Division 2 women’s volleyball team. I learned a lot about volleyball technique, strategy and performance training. I saw the importance and benefits of sports specific training. Through self-training and motivation, I increased my vertical jump and my quickness and balance which made me much more efficient on the court. I was recruited to a men’s volleyball team at a community college in Los Angeles. There, I was started as outside hitter and lead the team as a team captain in my two years with them. During that time, I became an assistant coach for the women’s volleyball team and started a sports specific training program for volleyball concentrating on vertical jump and agility. This greatly improved both individual and team performance. My personal experience has taught me how young athletes can benefit from sports specific training. That’s RISE Total Fitness we will be offering vertical jump training as well as agility sessions to help young athletes perform better and succeed at their chosen sport. We will be addressing all types of sport specific training for soccer, basketball, volleyball and football. I hold a Master’s Degree of Fine Art, but my path has always led me to sports. I am currently obtaining a certification from the American Sport & Fitness Association for Sports Specific Training. I look forward to meeting you and welcome any questions that you may have. 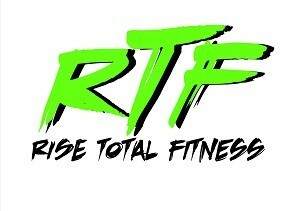 You can reach me at risetotalfitness@riserockwall.com or 214-717-3585.